OK OK, I know I haven’t shared more Thanksgiving recipes with you. The truth is, I’m a last minute kinda gal. To me, Thanksgiving could be months away – it’s not even on my radar! But I realize that most normal people have been planning their Thanksgiving recipes for a while now and have probably figured out their menu. If you haven’t planned yet and you’re last minute like me or there’s wiggle room on your menu – you’re going to want to give this casserole a shot. To be completely honest, I didn’t know how this Marcona almond-maple cream sauce was going to turn out. I thought it might be too blah and not have enough flavor to take the place of a cheesy, milky goodness that’s typical of a casserole of this kind. Boy, was I wrong. It’s pretty crucial that you use Marcona almonds – they’re a Spanish almond that’s a bit sweeter than the typical almond you buy in the store. I opted for roasted unsalted, but if you can’t find unsalted, slated is fine – just don’t season with salt anywhere else. 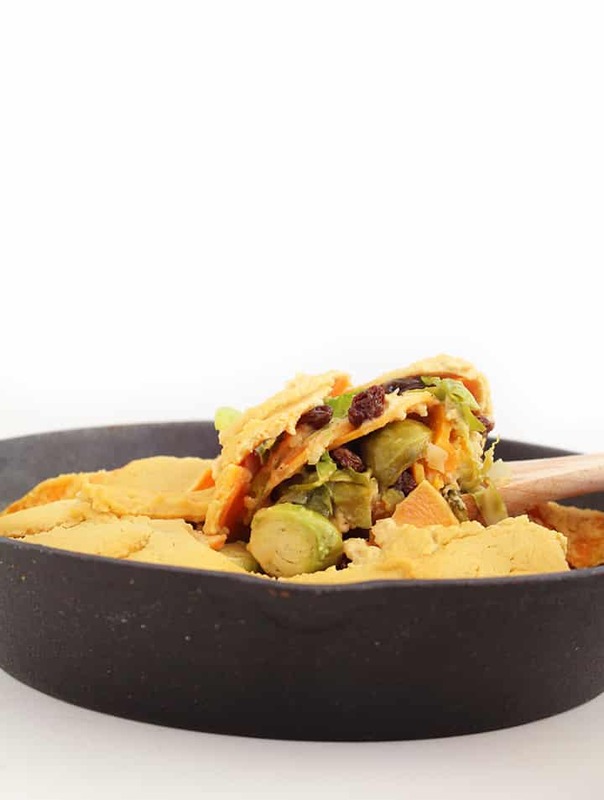 The brussels sprouts and raisins offer another savory and sweet touch and a great texture. 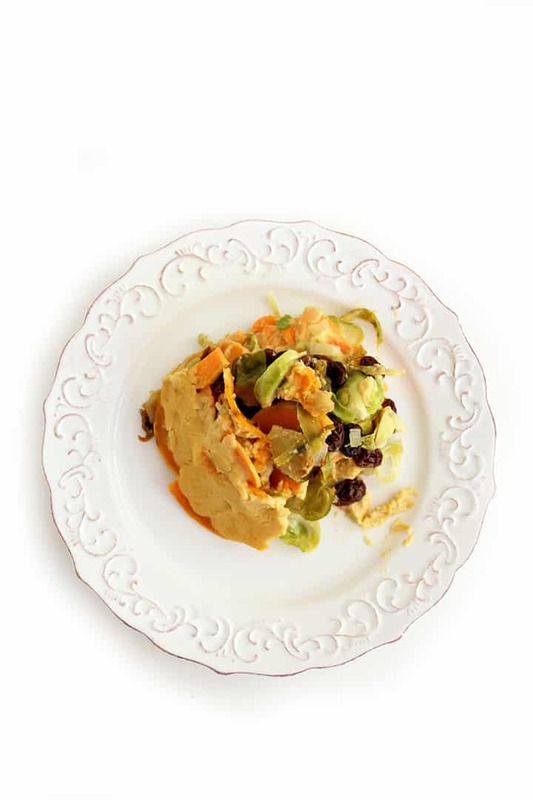 Of course, we’re using spiralized sweet potatoes here as the layers – their sweetness marries well with the maple in the cream sauce and the raisins. To shred the brussels sprouts slice the top bottoms off and then slice them into quarters or thirds, lengthwise. Or just take a knife and chop until they look shredded – there’s no specific way they really need to be “shredded,” just as long as they aren’t in thick chunks – you want them leafy. If you want to avoid using added sodium and loathe broths, you can swap in almond milk for the vegetable broth here – it will create a slightly thicker consistency that’s just as delicious. I’m sorry for the delay in the Thanksgiving recipes! I’m going to do a roundup tomorrow to make up for it, I promise! Preheat the oven to 425 degrees. Grease a 10” cast-iron skillet with cooking spray and set aside. In a large skillet, add in the olive oil. Once oil heats, add in the shallots and let cook for 1 minute or until fragrant. Add in the brussels sprouts and season with salt and pepper. Cook for 3 minutes or until almost cooked through, stirring frequently. When done, transfer to a medium bowl, add in the raisins, toss to combine and set aside. While brussels sprouts cook, combine all of the ingredients for the dressing into a high-speed blender (I used my Nutribullet) until creamy, about 2 minutes. Set aside. Slice the sweet potatoes halfway through lengthwise, careful not to pierce farther than the center. Spiralize the potatoes using Blade A. 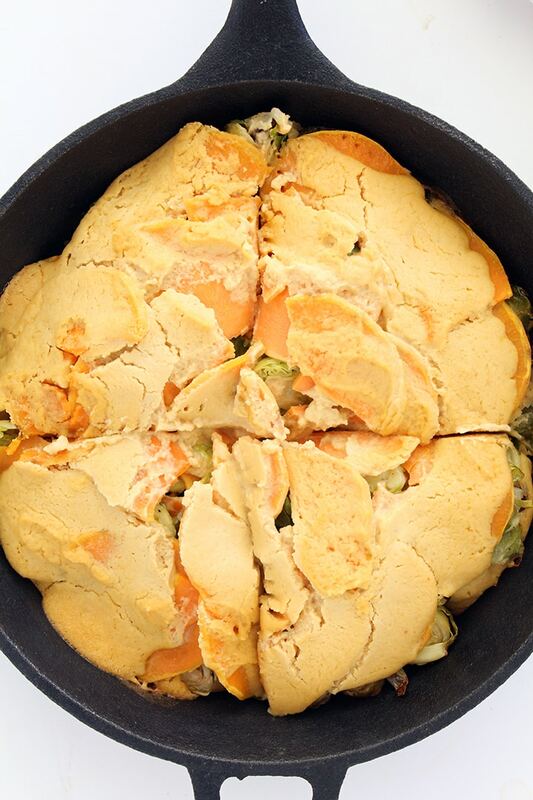 In the bottom of the prepared cast iron skillet, add in a layer of the sweet potatoes. 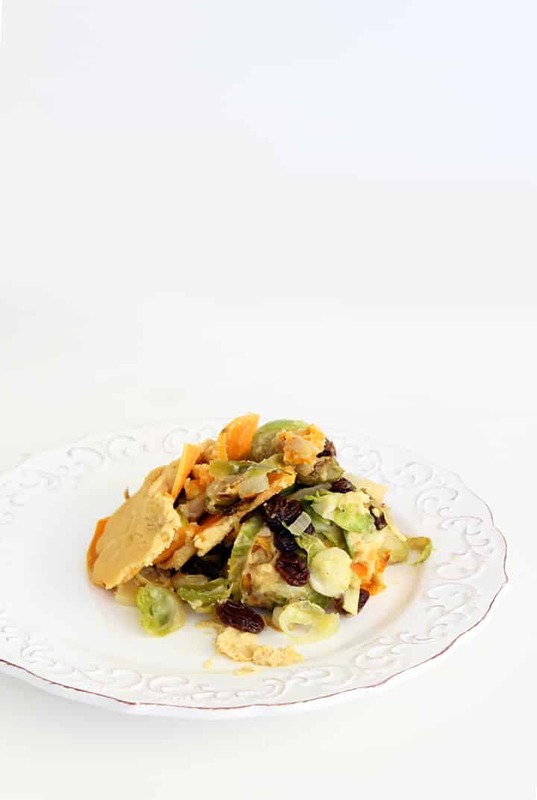 Top with a layer of the almond cream sauce and then top that with a layer of the brussels sprout-raisin mixture. Top that with another layer of the sweet potatoes, then another layer of the almond cream sauce and then top with the rest of the brussels sprout-raisin mixture. 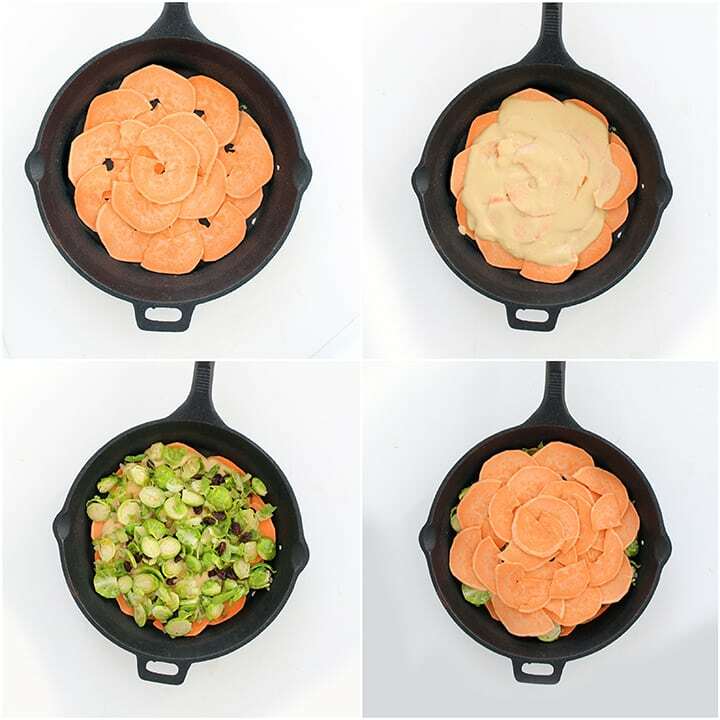 Top the brussels with the remaining sweet potatoes and top with the remaining almond cream sauce. 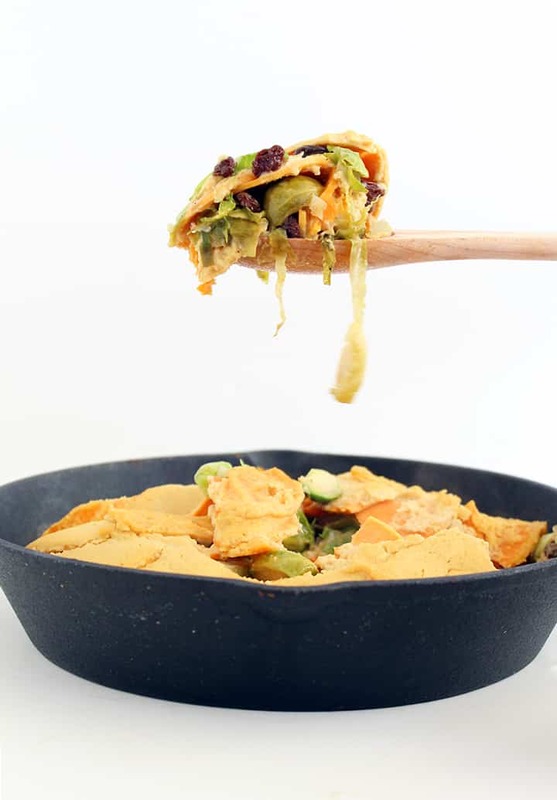 Cover the skillet with tinfoil and bake for 40 minutes. Remove the foil and bake for 5-10 more minutes or until sweet potatoes are easily pierced with the fork. Let cool for at least 5 minutes and then serve. Oh, I am SO making this for Thanksgiving this year! But I think I will substitute dried cranberries for the raisins. Thank you!!! 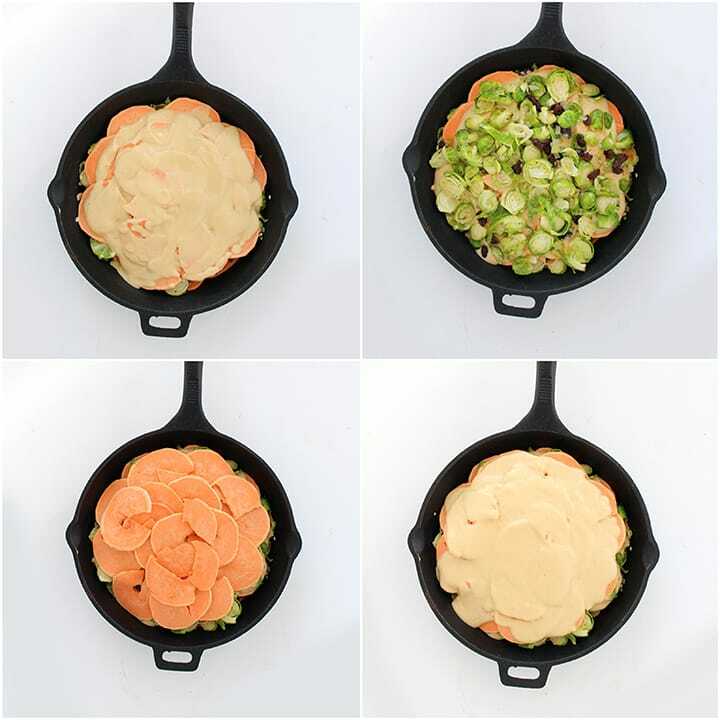 This combines my two favorite fall sides -- brussels sprouts and sweet potatoes. Dried cranberries would be amazing! BTW, for some reason the photos are not showing up for this post. Is it you or is it me? I tried on two different browsers and they show up! Yes, they showed up a little while later for me. Don't know what the problem was, but it's fine now. Sounds delicious and i plan to try it for Thanksgiving. Am i just not seeing it or is the nutritional info missing. Do you happen to know the nutritional info so i can figure out weight watcher points plus? I just made this recipe. For some reason the sauce didn't get creamy at all. I am going to try baking it like that anyway, but it's fairy watery. Any suggestions? Once you make it, the sauce firms up and becomes creamy! This looks absolutely delicious and I cannot wait to make it! I don't have a cast iron skillet though, can you recommend something similar that would work?? 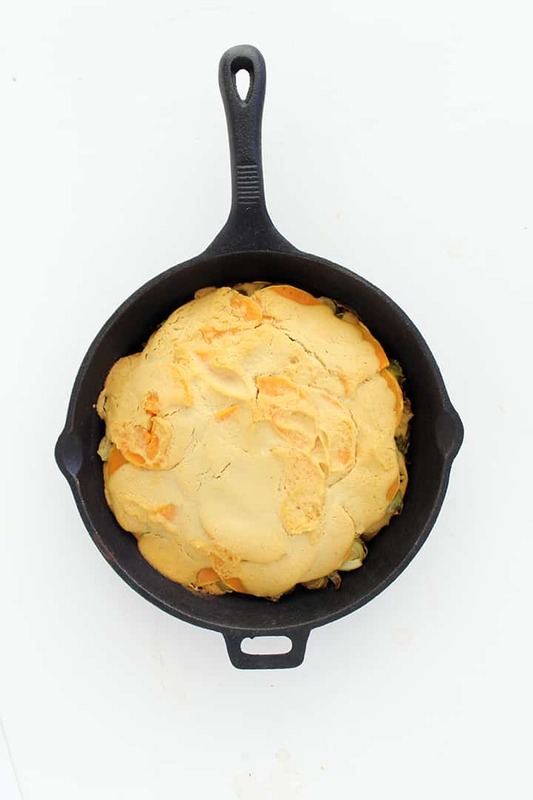 You can try a regular 10" nonstick skillet! Or, a small casserole dish! Do you have any suggestions to substitute the almonds (nut allergy)? You can use boiled cauliflower for a similar consistency! Where is the actual instructions for the sauce?